Workers hustle to climb aboard the wreck train. CMStP&P crane clears the line. 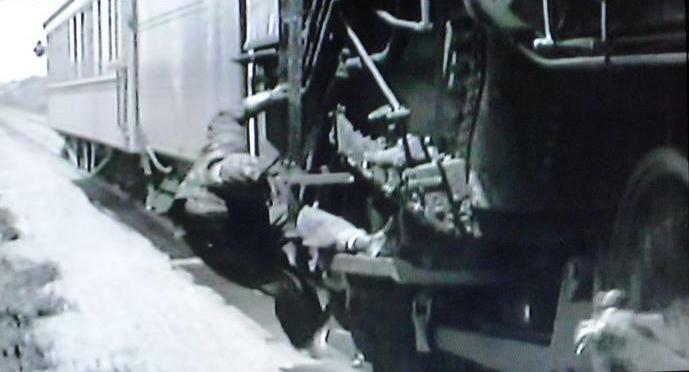 Superintendent Dan Thorn (Louis Wolheim) at the clean up site discovers old rail Larry Doyle (Robert Armstrong) riding as a hobo. Despite his gruff persona, Thorn is a soft touch, and quickly hires Doyle and puts him back to work. A romantic triangle ensues when Doyle promptly falls for Thorn’s girl Mary (Jean Arthur). 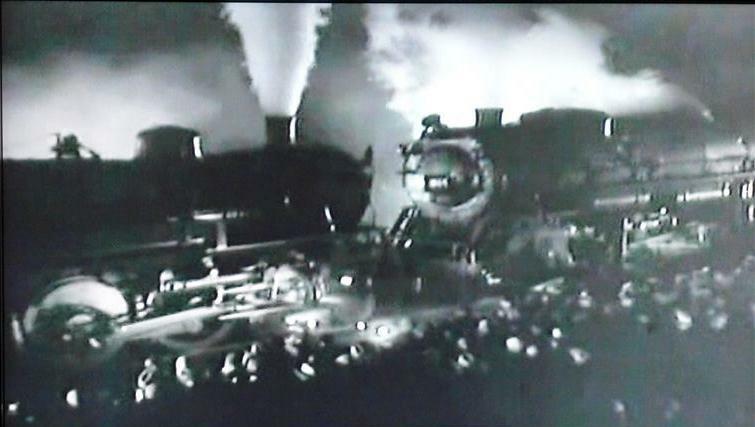 Doyle takes Mary to the old Railroader’s Ball which included this incredible scene of two steam locomotives trying to shove each other backwards. 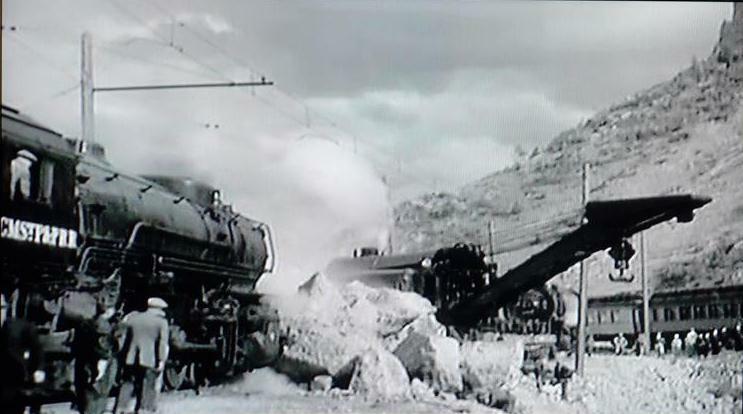 The movie shows quite a bit of Milwaukee Road steam operations based around their Miles City, Montana roundhouse. There are also scenes in 16 Mile Canyon (further west in the state) with catenary above, although no electric locomotives appear in the picture. 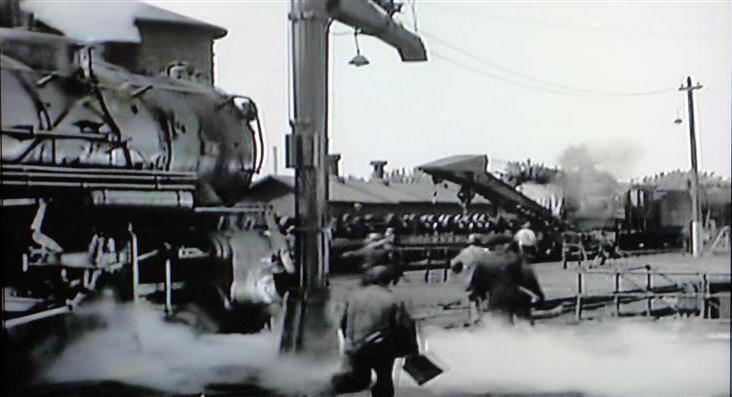 Engineer Doyle hangs on as he extinguishes a hotbox fire on the locomotives’ trailing truck during its mad dash eastward. Danger Lights finishes with a record run to Chicago with the ailing Dan Thorn on board. Larry Doyle saves the day, gets Thorn to the brain surgeon in time, AND wins the hand of Jean Arthur! This Milwaukee Road steam extravaganza should be in every railfan’s collection. Webmaster, Blogmaster, Ferroequinologist - Lindsay Korst works for a nationwide home improvement center after a 20+ year career supporting computer users. A resident of the Seattle area since 1976, he has had a life-long interest in railroads, particularly those in the Pacific Northwest. He is an enthusiastic participant in the Great Northern Railway Historical Society. He and his wife reside in Redmond, Washington. This entry was posted in Uncategorized and tagged Chicago Milwaukee St. Paul & Pacific Railroad, Danger Lights, Jean Arthur, The Milwaukee Road. Bookmark the permalink. 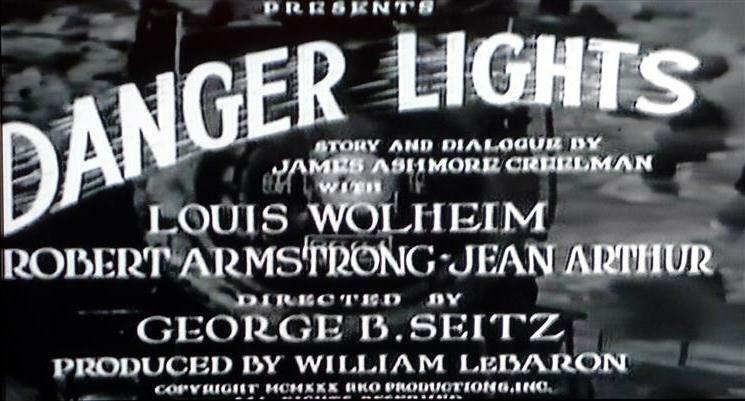 “Danger Lights” is a true classic!